Al Jaffee, at age 96, has a few words for Donald Trump about how the president is handling health care. A few pictures, too. Jaffee is not only the longest-working cartoonist in comics history, as recognized last year by Guinness World Records, but the MAD magazine legend is also the father of the “fold-in,” the publication’s back-page feature that reveals a surprise message and image once the illustration’s middle section is collapsed. Jaffee then offers his dire answer, which reflects reports that tens of millions of American will lose their health coverage if the government repeals and replaces the Affordable Care Act, which Congress continues to debate. His pointed verdict is viewed when you fold in the sides. “The fold-in is a sort of bait-and-switch process,” Jaffee tells The Washington Post. “The full-page scene asks and illustrates a question. After the page is folded, a surprise new scene and answer appear. For part of his childhood, Jaffee grew up poor on a shtetl in Zarasai – “the Siberia of Lithuania” – and those years fostered not only his artistic creativity, but also his distrust of adult authority. He says he has little patience for bloviators, and that, unfortunately, the world is stocked full of them. Jaffee began satirizing political candidates in MAD’s pages in the ’60s, and his fold-ins have appeared in nearly every issue since 1964. MAD’s editor in chief, John Ficarra, relishes that after a half-century, Jaffee’s art still delivers the spit and vinegar of acidic satire. 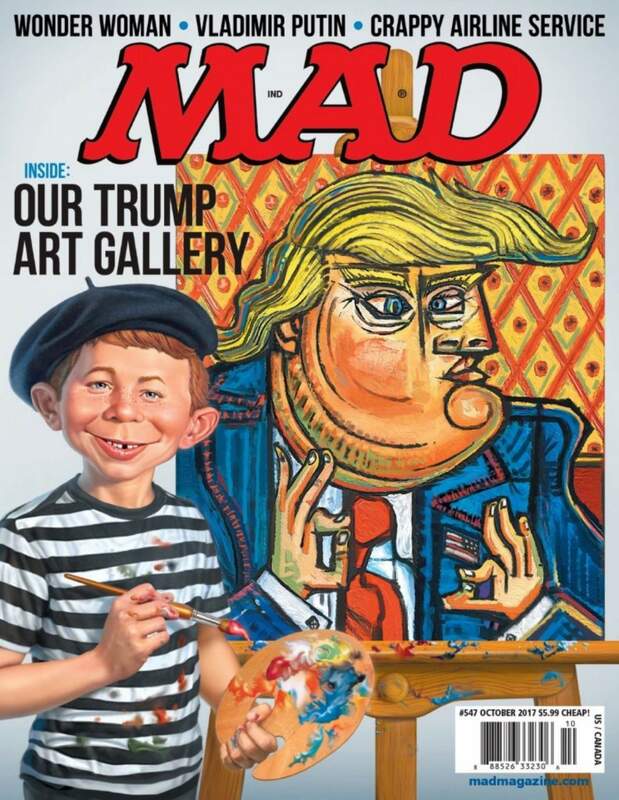 The new MAD issue, which also features an extended “Trump Art Gallery” of visual spoofs of famed artists, hits newsstands Aug. 8.